Teachers are supposed to inspire the younger generation to follow their dreams and achieve great things. However, our hero, Nozomu is not that teacher. Nozomu's probably the most depressive man in Japan--so depressive, in fact, that every little setback in life inspires yet another suicide attempt! But then why is being in Nozomu's class such a blast? Is it his quirky and endearing students? The bizarre adventures he leads them on? Or is there something after all to "the Power of Negative Thinking"? DOES HE KNOW IT'S CRISTMAS TIME AT ALL? 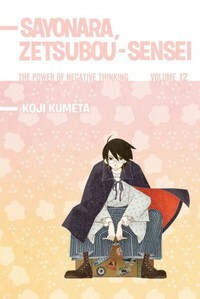 Itoshiki Nozomu, the world's most negative person, is about to suffer an ironic twist of fate. His 32 students, who each have their own weird problems, have ocnstantly foiled his continual suicide attemtps. With Christmas right around the corner, will Nozomu finally discover joy this holiday, or will he be granted the ultimate gift? Includes special extras after the story!